The diaper liner SENS-U also contains a colorchart. Results can be read manually, og scanned with a mobile-app. Poto: An-Magritt Larsen, USN. A newly developed diaper liner can register substances in older patients urine, and rule out the possibility of urinari infection. "Staff working in nursing homes and homecare have told us about how difficult it can be, to collect valid urine samples from older patients with urinari tract ailments. This project is based on their experiences and needs. We wanted to come up with something that was easy to use, and safe for the patients", says Haakon Karlsen at Department of Microsystems, University College of Southeast Norway. He recently disputed for his PhD and presented the results of many years research. The researchers use advanced microfluid-technology. They have developed a method that leads the urine through microscopic channels in paper and porous materials, into a sealed chamber in the liner. In there, the urine is analyzed in a sterile environment. The liner contains no electronics or battery, mainly due to security issues, but also to keep the price of the new product as low as possible. 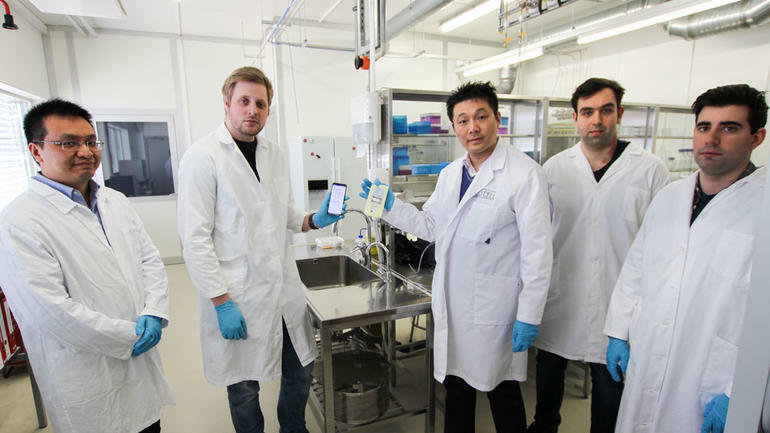 In addition to the liner, PhD Karlsen in the research team led by Professor Tao Dong at Department of Microsystems in USN and the programmers in Sensovann AS, have developed a mobile-app, easy to use by health personell who want to scan the results and add them to a digital database. It is also possible to read the results manually, and the liner is equipped with a color-chart which makes it possible to check the results without a mobile phone. There are similar products available in Norway, but they only register nitrite and leukocytes. This newly developed liner will be able to register between five and fourteen substances. "The aim is really to exclude the possibility for infection", says Karlsen. Many old patiens in need of care have to go through unpleasant and invading tests and catheterization, or start antibiotic treatment based on symptoms like fever. As this may help patients with urinary infections, it also results in patients without infections to receive antibiotics. "This new technology is meant as a pre-screening solution, which will quickly rule out bacterial infection as a possible cause. Our goal is to reduce unpleasant tests and to minimize the unnecessary use of antibiotics", says Karlsen. Old patients have the highest occurrence of urinari infection, and the more in need of care the patient is, the higher occurence. So-called dipsticks are often used to analyze urine samples in pre-diagnostics. They are quick and handy to use, but a study from University College of Southeast Norway shows that 40% of nurses and health workers are unsure about wether they have read the dipstick-analysis in the correct way. The reason for this is usually that it is difficult to spot, or interpret differences in color on the tests. (Pia Bing-Jonsson and Siri Tønnesen, 2016 "Urinary tract infection among older patients in the home care services. "Sykepleien Forskning. "80% of old patients at nursing-homes suffer from incontinence, or have other reasons to use adult diapers. Conventional dipstick-tests can not be used in diapers. Because of this, there is a huge demand for diaper liners with the same functionality as dipstick-tests, but with the possibility for easier collection of urine and more functional reading of the results", says Haakon Karlsen. By having the liner in the diaper there is a risk of contamination, but as the urine is isolated after having entered the liner, this risk is reduced, and also the risk of making the wrong analysis. "Health staff will spend significantly less time and effort on collecting urine samples from patients with incontinence, and the patients will profit from faster results and more efficient treatment", says Haakon Karlsen. He has focused on integrating the use of the diaper liner in the daily routines of nurses and health workers. "They can place the liner when changing the diaper, and remove it when changing the diaper again. For this to work, the results must be reliable for at least four to eight hours. An ordinary dipstick has to be read within a few minutes, due to drying and oxidation. We have therefore worked hard on keeping the results over time", says Karlsen. Haakon Karlsen did his PhD at the Department of Microsystems, campus Vestfold. Professor Tao Dong at the department has Karlsen's main supervisor, and associate professor Zhenhe Suo at Faculty of Medicine, University of Oslo, has been Karlsens co-supervisor. The project has been supported by Oslofjordfondet, which financed parts of Karlsen's PhD work. The project has also been included in The Research Council of Norway's "Forny 2020" program, with 5,8 million NOK in financial support for commercialization and completion within a period of two years. 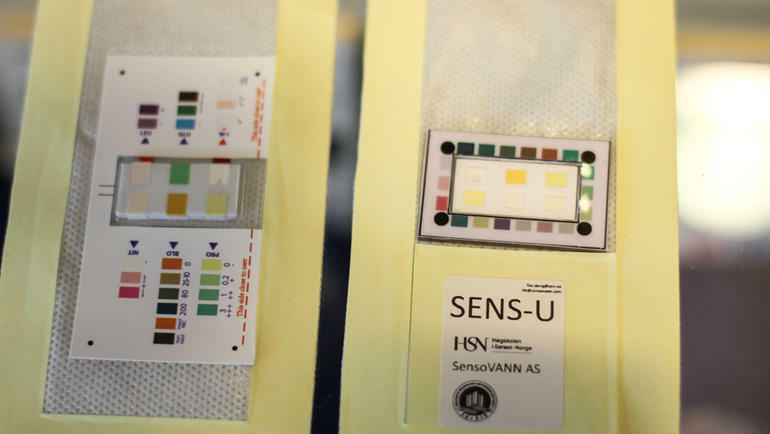 SENS-U is developed in collaboration with PhD Zhaochu Yang and PhD Nuno Miguel Matos Pires at Sensovann AS. Haakon Karlsen has started working in Sensovann AS to further develop the technology. 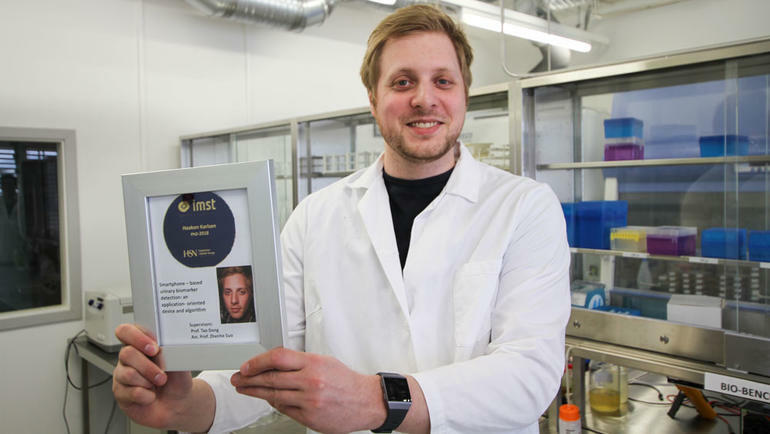 This company was started as a spin-off from University College of Southeast Norway by former research fellows at the Department of Microsystems. The patent is owned by Sensovann AS and University college of Southeast Norway. Testing, development and sertifications are due to finish in spring 2019.